Community feedback is being sought for options for the Murulla Street causeway at Murrurundi. There are two options for the causeway project worth more than $1 million, one is lower to the ground and the higher option could obstruct the view of the historical Swinging Bridge. The Swinging Bridge, a wooden foot bridge built in 1927, will be protected during the project and necessary maintenance work undertaken at the same time. 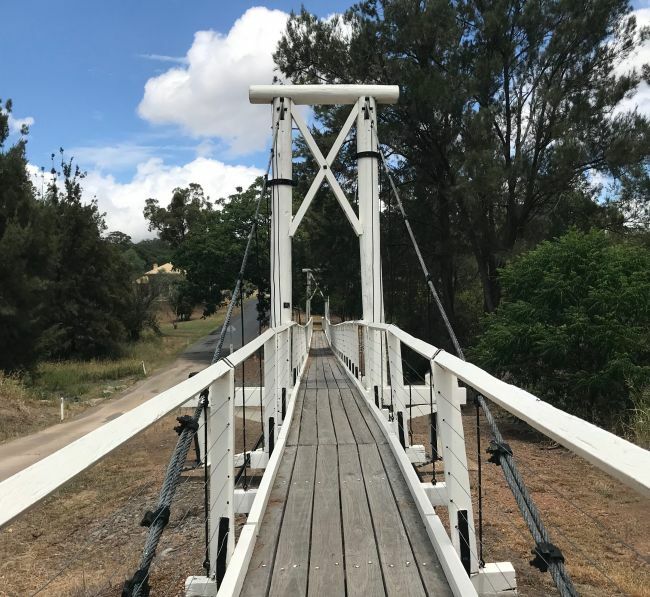 The Swinging Bridge is listed as an item of regional significance in the Upper Hunter Local Environmental Plan 2013 and Council undertook $70,000 worth of repair works on the bridge in 2012 -2014. The existing one lane causeway requires regular maintenance and has to be closed when the Pages River is high. Council plans to upgrade the causeway to a two lane, concrete bridge to increase safety and reduce maintenance and closure costs and inconvenience to road users. Council has been granted $1.15 million in funding under the Upper Hunter Regional Mine Affected Roads program, funded from Restart NSW Resources for Regions which was put in as a joint application with Muswellbrook Shire Council. The total cost of the project is $1.25 million. The project would require the causeway and access to the Swinging Bridge to be closed for several months during construction, scheduled from October 2019 to completion of the bridge in mid 2020. Council has engaged independent experts to undertake a Waterway Study and detailed concept designs. Already completed are the geo-technical investigations, a Review of Environmental Factors, a Statement of Heritage Impact Assessment and Visual Impact Assessment. These investigations helped determine two basic design options: a lower bridge which would have a less visual impact on the Swinging Bridge; and a higher bridge which would allow for access during higher flooding levels. fax 6545 2671 or drop them into any Council office.